Here's some sobering data on information overload -- and how to stay productive. NEW YORK ( MainStreet) -- With March Madness about to start, college basketball aficionados -- otherwise known as your employees -- will be hovering over their carefully chosen brackets, scouring social media sites for player information and watching the occasional afternoon game through their work computer. As the business owner and manager of those workers, your job is to make sure they still get their jobs done and that events such as March Madness don't get in the way of your company's output. But how do you do that when iPhones are everywhere and workers have essentially become multitasking agents -- combining work and personal lives at (theoretically) all times of the day? 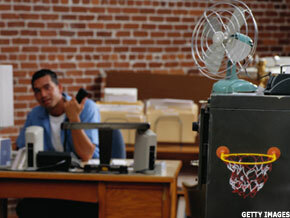 March Madness is a great time to if whether workers are doing what they're supposed to -- and how to fix it if not. What are detractors to employee productivity? Spira: We have a lot of trouble paying attention. We have developed into a workforce with very short attention spans, and that tends to be a problem because keeping a focus on something without self-interrupting is difficult. Self-interrupting counts just as much as you interrupting Bob or Susan. We also evolved into a society that is predicated on instant gratification. We also tend to get a huge amount of information in tiny, little nuggets. And studies have shown this barrage of information basically lessens our ability to absorb deeper and greater thoughts. Throw March Madness into the mix with lots of news, everything we need to know about college basketball -- and the more information we get, the more we're going to crave -- so in this particular period of time there is going to be a bump up in this information flow that will result in further interruptions in our work and simply just make it that much more difficult to complete tasks and get through the day. 4. Sixty-six percent of so-called knowledge workers feel they don't have enough time to get all of their work done each day. Spira: There is no good way of measuring productivity in what we call the knowledge economy. We moved squarely from an economy that largely produces things to an economy where most of us work away from the raw materials and are more likely to do something with paperwork or a computer. We have a very big conundrum: How do you define "product" in the knowledge economy? OK, so how do you make sure employees are doing what they are supposed to be doing? Spira: You can't micromanage and put too many limitations on people, because that will only breed resentment. But you do have to make sure that work is getting done. I think it gets down to creating a workplace environment that lends itself to the fewest number of distractions possible. 1. Set reasonable expectations. For instance, a lot of companies and people feel that emails have to be responded to within minutes. Set reasonable expectations when an email is not urgent for replies "by the close of the business," "within 24 hours" or something that just strikes everyone as a reasonable balance. 2. Communicate. You have to discuss it amongst employees. We want to make sure that we're on the right path to making sure you're not overloaded by email or feeling you need to drop other things just to respond to emails, because most emails are not mission critical and they can wait. 3. Adjust policy and procedure as needed. Take a step back and examine how you work. Does it make sense for us to work the way we work? Are the tools that we are using meeting our needs? Are our customers happy? Reach out to talk to customers, partners and suppliers -- how do they feel about the way we communicate and collaborate to make sure that we're aligned with them in addressing their needs? Take this March Madness period as a period of inner searching and reflection and talk to partners, suppliers and customers to make sure that we're actually doing things in a way that works for them and vice versa. But shouldn't there be some limitations? Spira: Even trying to put limitations on things today is a fool's errand. There was a time when you simply didn't make personal phone calls or you didn't get them. If you got them, it was because your neighbor was calling to tell you your house was on fire. When you were at work, you were working. It's not like today, where you're texting and talking to friends while you're at work. It went down the tubes when mobile phones became more prevalent. If Web sites are blocked, you can go on your smartphone. Instead of putting restrictions, you want to teach people healthy attitudes toward the work they are doing. You have to look at this as a certain enlightened approach. The draconian approach of clamping down does not work. The enlightened approach of setting expectations is just raising the fact that there is such a thing as information overload.